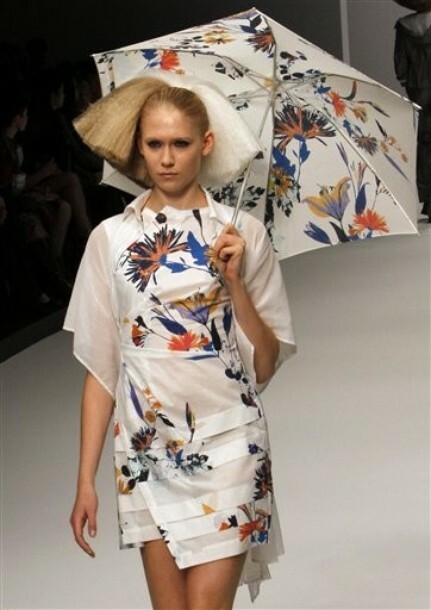 Kamishima Chinami is another show I’m looking forward to during Japan Fashion Week A/W 2011-12. 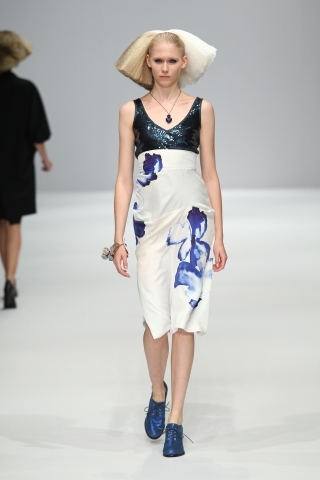 Having launched her label in 1998 she showed her first collection in 2002, and opened her first store in Aoyama in 2004. Since then, she has had no less than 10 collections at Japan Fashion Week. The most recent being…. In this collection her use of voluminous wigs proved distracting to some but certainly gave edge! My favourite pieces were the more clearly eastern influenced ones with obi sashes or painterly, almost calligraphic floral prints. There were quirky plays on texture as tight smooth skirts were paired with loose knitted tops covered in a multitude of ruffles in the divine coral colours of a savannah sunset. Or dresses had form-fitting tops with the textured ruffles from the waist down. Even more interesting to me are some previous shows. 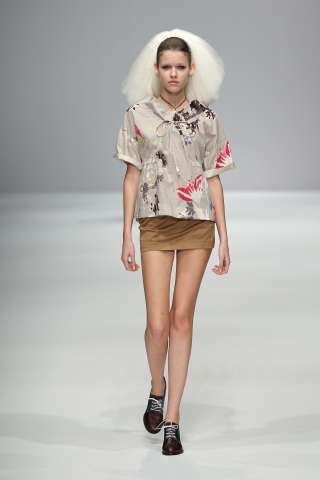 I especially loved the Spring Summer 09 collection which had somewhat of an African theme. The use of raffia (recently done by Sass and Bide, see last pic) reminds me of Masai headdresses. Some were in desert colours of ochre, while black and cobalt blue were also used to striking effect. Astonishing things were also done with safety pins to create unbelievable texture, the effect of which is couture, not punk, in aesthetic.